A 12-year-old boy who was rushed to the hospital after a sand tunnel collapsed on him at a New Jersey beach has died. The boy and his brother were digging a tunnel at the Long Branch, N.J., beach late Tuesday when it collapsed on him, trapping him under the sand, police and witnesses said. Lifeguards pulled the boy out of the sand and began administering CPR. He was unconscious "with blood trickling from his nose," a witness told the Asbury Park Press. The boy was rushed to Monmouth Medical Center, where he was placed in the pediatric intensive care unit. He was pronounced dead on Wednesday afternoon, hospital officials told the paper. According to NBCNewYork.com, a fire truck responding to the tunnel collapse struck a man holding his infant son, "knocking them both to the ground." Both were taken to Jersey Shore Medical Center, NBC said. The father suffered broken limbs; the baby was "injured but not severely." Sadly, deaths from sand tunnel collapses are not terribly uncommon. 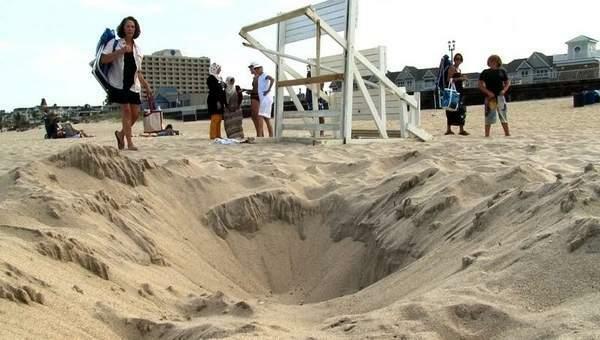 According to CBS News, there were at least 16 beach-hole-related deaths between 1990 and 2010. According to a 2007 report in the New England Journal of Medicine—"Sudden Death from Collapsing Sand Holes"—there were 31 over a 20-year span. "At least once a day, lifeguards have to stop someone from digging a hole too deep," a lifeguard told the North County (Calif.) Times after an 18-year-old man nearly suffocated in a sand tunnel collapse. "Holes are a hazard for everyone who uses the beach."